My husband and I started looking for a new home when we found out we were expecting a baby. We had many particular interests in mind: an old house, a great neighborhood, a workshop…you name it, we wanted it! We traipsed east, west, north, and south throughout Monroe County until we found our forever home. All the while we were searching, Mary Jane and Sandi were patient, gracious, and understanding of our needs and wants. It felt like we were working with old friends who really understood us. Now, more than two years later, we still see and hear from them, and we are so glad we do! We have recommended Mary Jane and her team at RE/MAX to friends, who have their own success stories. I’ll continue recommending them to anyone looking for a new home. If you want a realtor who really looks out for your best interests, contact Mary Jane. Mary Jane and Sandy Kuter listed our home and we had multiple offers the first day. Sold for more than the asking price. Process of listing was very easy and marketing was top notch. Great experience from beginning to end! We would highly recommend Mary Jane and her team! My husband and I started looking for a new home when we found out we were expecting a baby. We had many particular interests in mind: an old house, a great neighborhood, a workshop...you name it, we wanted it! We traipsed east, west, north, and south throughout Monroe County until we found our forever home. All the while we were searching, Mary Jane and Sandi were patient, gracious, and understanding of our needs and wants. It felt like we were working with old friends who really understood us. Now, more than two years later, we still see and hear from them, and we are so glad we do! We have recommended Mary Jane and her team at ReMax to friends, who have their own success stories. I'll continue recommending them to anyone looking for a new home. If you want a realtor who really looks out for your best interests, contact Mary Jane. Thanks for being there for us when we need you. You’ve always given us the best service, always looking out for our needs. That’s why we keep coming back. 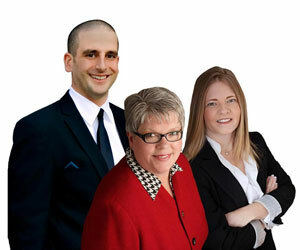 We can't imagine working with anyone else but the Mary Jane Mahon team for home buying. As first time home buyers we needed a lot of help and guidance. It was easy to trust that they had our best interest at heart. We faced a few bumps in the road and they fought to make sure we got what we needed. They were always in communication with us and didn't leave us wondering where we stood in the transaction. Plus they are just so pleasant and fun to be around! We highly recommend them and will definitely be using them again in the future. We received exceptional service beginning when we first began looking for a home, to the completion of the closing and beyond. You were always there to take care of everything and went above and beyond what was expected. If we ever know anyone who is looking for real estate, we would recommend you without hesitation. Can't think of ONE thing that could have been better. This is the 5th house I've purchased and have NEVER had better service from a realtor. Mary Jane Mahon and Mike DiMino are an A+++++++ team. "Words cannot express how much Donna and I appreciate your wise advice and hard work in making the sale of our home happen in such a challenging environment. We will continue to sing your praises and pass out your business cards at every opportunity!" - Jennifer L. Gravitz, Esq. "Thank you so much for everything you did to help us sell our old home and find us a new home. At times, we know, it was more than trying, but you kept at it. You were very helpful and kept a good humor throughout the whole ordeal, which helped us be more at ease. We are so very happy to be settling into our new home and we have you to thank!" "Mary Jane Mahon was wonderful throughout this ordeal—she was always just a phone call away with a calming way to sooth our anxiety. We feel fortunate to have her as our REALTOR." "Thank you again for... all the help you’ve given us." "Words can explain how much I appreciate Mary Jane Mahon’s help, laughter & patience through the process towards home ownership." "I just wanted to thank you for all your help in assisting me with buying my first home. You definitely went above and beyond the call of duty with me...and I just want to let you know your work did not go unnoticed!" "Mary Jane Mahon is the most professional and personable real estate agent I’ve ever known. She is accessible, timely and thorough in all her work. There have been no unanswered phone calls or questions. Mary Jane is knowledgeable and has been straightforward about all aspects of the sale. I highly recommend her services."